Today, March 26, 2017, is the 90th anniversary of Dorothy Arzner’s credited directorial debut, Fashions for Women (1927). Arzner was the only woman director employed in Hollywood’s studio system during the 1930s and ’40s, and to this day she remains the most prolific woman studio director in American cinema. To celebrate her achievements, Flicker Alley is proud to present this guest essay by Elyce Rae Helford, Ph.D., about the excerpt of Arzner’s Dance, Girl, Dance (1940) included on Early Women Filmmakers: An International Anthology. Elyce Rae Helford is professor of English at Middle Tennessee State University. She is the senior editor of The Woman Fantastic in Contemporary American Media Culture (University Press of Mississippi, 2016), editor of Fantasy Girls: Gender in the New Universe of Science Fiction and Fantasy Television (Rowman & Littlefield 2000), and co‑editor of Enterprise Zones: Critical Positions on Star Trek (Westview Press, 1996). Her most recent work centers on gender and sexuality in the films of director George Cukor. More at www.elycehelford.com. 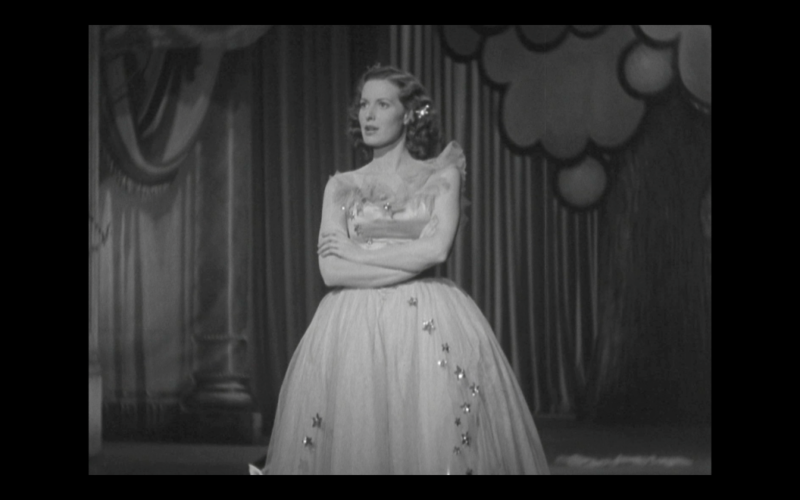 Maureen O'Hara as Judy in Dance, Girl, Dance. If you know the work of Dorothy Arzner, Hollywood’s most prolific woman/lesbian studio director, you probably know the amazing scene from Dance, Girl, Dance (1940) when exasperated dancer Judy O’Brien (Maureen O’Hara) confronts her cat-calling audience. And if you don’t know it, you will after purchasing and watching Flicker Alley’s May 2017 Blu‑ray/DVD release of Early Women Filmmakers: An International Anthology. “Go on, laugh; get your money’s worth." “Go on, laugh; get your money’s worth,” Judy declares. “No one’s going to hurt you. I know you want me to tear my clothes off so you can look your fifty cents’ worth.” The greatest power in the speech is arguably in its last lines, taken from the screenplay co-written by Tess Slesinger (author of America’s first published story featuring an abortion) and based on a story by Vicky Baum. Here, the words of women pour from the mouth of a Hollywood actress directed by the only woman directing for the studios in 1940, and they turn the objectifying male gaze back on itself. Judy has gone from passive “stooge,” dancing in balletic style for laughs that become whistles when the striptease of her friend Bubbles (Lucille Ball) begins. 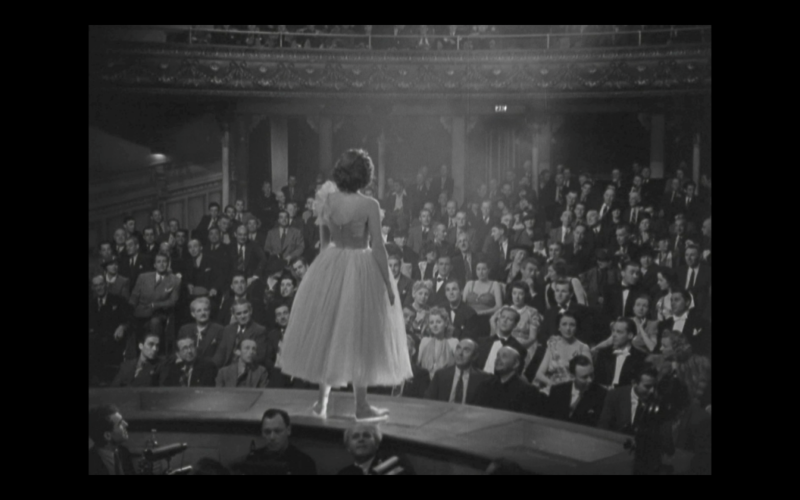 Judy looks directly at the audience as the camera pans over the faces of men, stunned silent, and their passive (enabling) female dates. 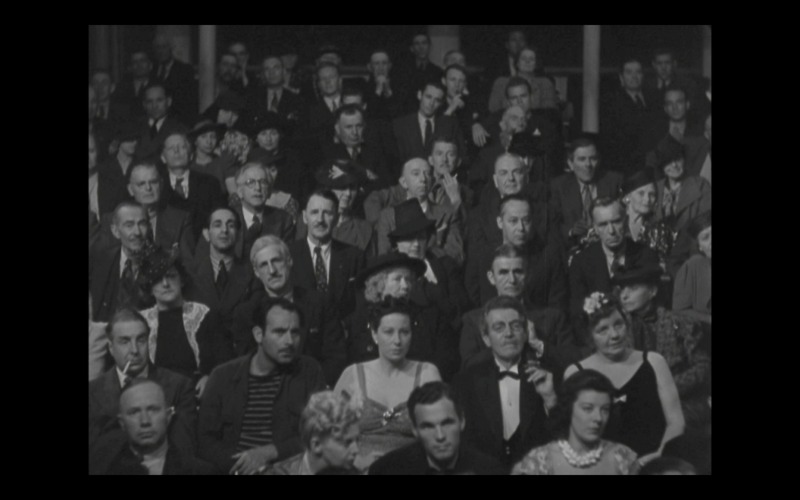 The audience stares at Judy. Few Hollywood film speeches before or since have so directly turned the tables on gender roles, suggesting not only that men stare at and strut before women to feel empowered (or, via Freud, to feel less fearful of the castration that women represent) but also that women aren’t fooled for a moment by their gawking and gadding. Women know the serious game they are playing and why. And we bring our critical gaze to bear on it, even when we allow men to think they’re controlling us by ogling and displaying their dominance. 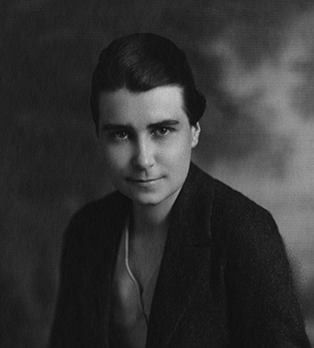 Dorothy Arzner, too, knows the game, for it is central not only to the burlesque hall but also the office of the Hollywood producers. 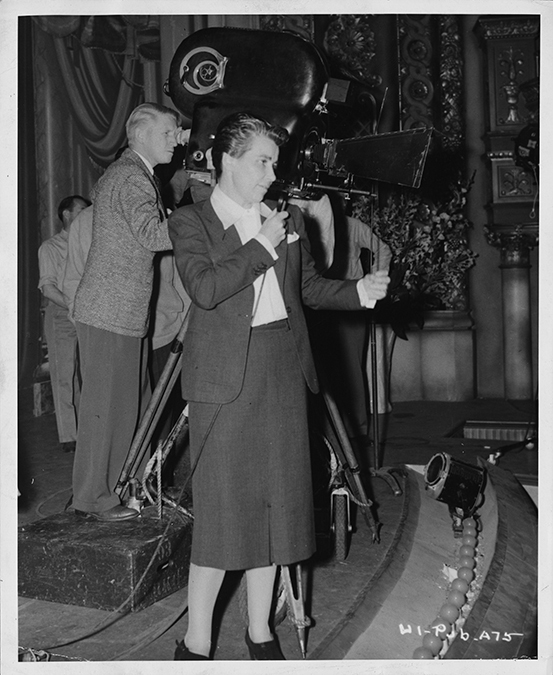 Dorothy Arzner directing Dance, Girl, Dance. Moreover, this scene is in service of an even greater feminist good: the film resists traditional genre demands. Dance, Girl, Dance is one of a precious few Hollywood pictures of its era that partakes in elements of the romantic comedy (and perhaps a bit of the tearjerker) while ultimately rejecting the requirements of the genre in its conclusion. The heteronormative happily-ever-after that sees starry-eyed central couples married off after misunderstandings of various sorts is absent from Dance, Girl, Dance despite its dalliance with romance. Judy falls for a time for rich, handsome alcoholic Jimmy Harris (Louis Hayward), but ends the film in the big-brotherly arms of Steve Adams (Ralph Bellamy, Hollywood’s quintessential romantic comedy also-ran—see His Girl Friday and The Awful Truth). Even that embrace is because he’s given her a position in the legitimate dance troupe he manages. In fact, Jimmy exits the film returned to the arms of his ex-wife Elinor (Virginia Field), and a more arrogant, spoiled, and unsavory couple it is difficult to envision. Here marriage is shown as the least desirable of options open to women. And this is hammered home delightfully in the exit line of Bubbles, who has married Jimmy for his money but happily releases him to his ex at a cost to him of $500,000—no small sum in 1940! 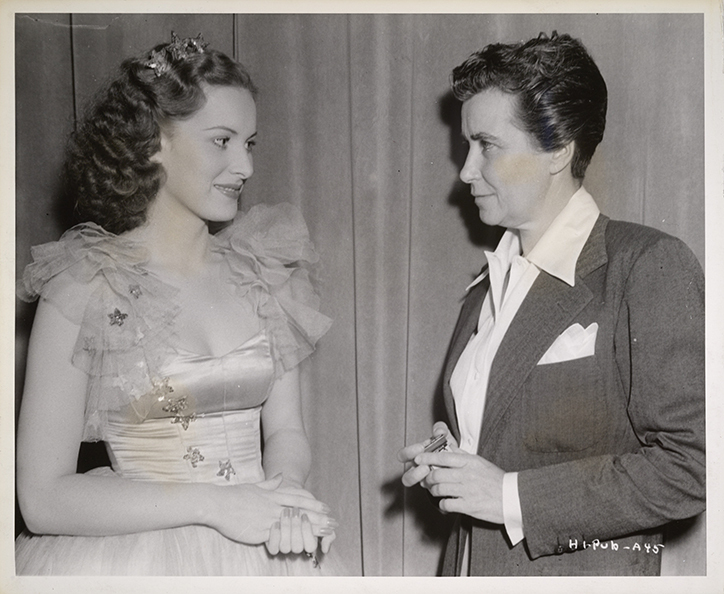 Maureen O'Hara and Dorothy Arzner on the set of Dance, Girl, Dance. In sum, through Judy’s open critique of sexism in film imagery and an ending that resists recovery of that sexism through adherence to romantic comedy norms, Dance, Girl, Dance offers a rare and joyous opportunity to experience self-aware feminist critique of Hollywood from within, courtesy of determined, pioneering director Dorothy Arzner. 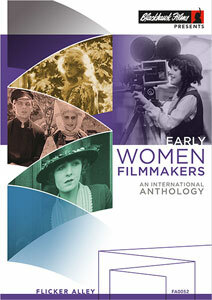 Pre-order Early Women Filmmakers: An International Anthology now at the special sale price of $49.95 for a limited time! Release Date: May 9, 2017.